Help us Welcome the New Year! First off, we would like to wish all our patients a happy New Year! Have you had time to reflect on your 2013 accomplishments and started your 2014 resolutions? 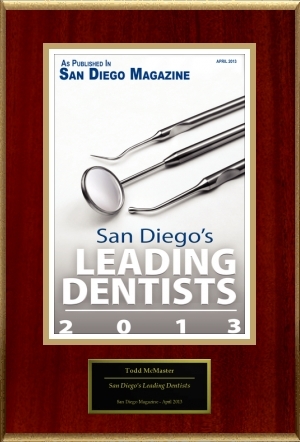 Well we wanted to take a moment and reflect Dr. Todd McMaster’s 2013 accomplishments by congratulating him on earning the San Diego’s Leading Dentist 2013 award. Published in San Diego Magazine, Dr. McMaster recognition was based on thousands of detailed evaluations by his peers. They recognize his dedication to give his patients healthy and beautiful smiles. We are extremely proud of our leading dentist in Escondido and this achievement would not have happened without the support from you and all of our lovely patients. Dr. McMaster is committed to achieving the utmost care, including staying up-to-date with the latest trends in dentistry. Please help us welcome the New Year by congratulating Dr. McMaster on his award, and for many more dedicated years of making your smile healthy. Share with us: What are your New Year’s resolutions?